Intriguingly only the UK’s recommendations specifically talk about including teachers in terms of developing the wider workforce. Anyway sounds like a good list to me. What does a public health response to drug prevention look like? The debate on what a public health approach to drug policy looks like is not only happening here in the UK but is something that Americans are also looking at following the publication of the Obama Administration’s latest drug strategy. fear-mongering and produce risk, blame and shame in their efforts, identifying “risky” lifestyles and behaviors. At its best, public health projects can address the complex etiology and interactions between individuals and their environments as well as focusing on the “upstream” societal factors—poverty and inequality, to name a couple—that are such important forces in determining one’s life chances. 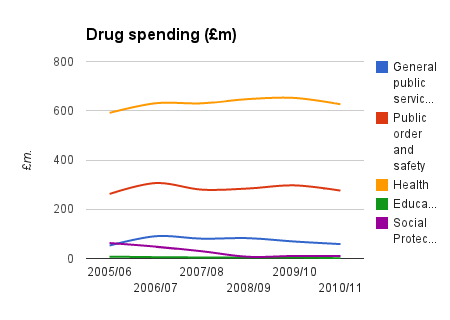 This concern that drug policy could get lost is (broadly) the same point that Marcus Roberts from DrugScope makes here about the emergence of Public Health England and the local government’s budget decisions when it comes to determining local need. The article on Points does however link to an attempt to map out what a public health approach may look like. Developed by the New York Academy of Medicine and the Drug Policy Alliance the Blueprint for a Public Health and Safety Approach to Drug Policy sets out one way that New York might try to tackle issues around illegal drug use. As you would expect the paper has sections that deal with prevention, treatment and the role of law enforcement. Readers will I hope understand if I focus on the recommendations for prevention. Effective prevention strategies enable people to make healthy choices and improve health outcomes for themselves and their families. Prevention can delay the initiation of drug use, avert the escalation of use, and diminish engagement in drug related activities that can lead to violence and/or criminal justice involvement. Prevention, here, is conceptualized both in its traditional sense of programs that provide education and skills to avoid or address drug use and, more broadly, to encompass community development strategies that address the root causes of drug use and offer individuals meaningful alternatives to drug use and drug dealing. Research shows that prevention programs can also be cost effective; for each dollar spent on prevention, communities can save up to $10 in drug treatment and counseling costs. Too often, however, drug prevention programs are underfunded, narrowly defined, and operate in isolation, especially from other health promotion and community development efforts. They are, however, keen to point out that what they are not calling for is solely investing in education and messaging (though they remain part of the mix) but to extend prevention to tackling the risk factors and building protective communities and environments in which young people can grow and which foster resilience. The conception of a community prevention strategy is focused on the social determinants of health, particularly by reducing unemployment – which, for the authors, is also linked with providing alternative economic routes for those who may otherwise engage in drug dealing. It is clear that the consultations that the authors did in drafting the report suggests that drug use by young people, and trying to prevent those harms was a significant issue for communities and professionals. Prevention programming that facilitates positive youth development not only decreases drug use, but also reduces delinquency, violence, drop-outs, and teen pregnancy. Community members and academics highlight several risk factors for young people that needed to be better addressed in New York communities, including normalization of drug use and other problem behaviors by the media, peers, and, in some cases, parents; academic failure; family conflict; community disorganization; and lack of opportunities for positive involvement with family and community members. The authors highlight the difficulty of providing positive out of school activities that focus on developing young people as a significant barrier to a good prevention strategy. The paper echoes our experience – see for example the youth led research we did for the London Youth Involvement project – that school drug education isn’t currently meeting the needs of young people. Several participants, including young people, felt that current education strategies were nonexistent, under-resourced, or ineffective. They are however able to report that nearly half (47%) of those who received prevention services got an evidence based programme; something we couldn’t claim. According to research, a broad health based curriculum including drug education, along with life skills and decision-making training, can impact the choices young people make on a range of issues (drug use, gang involvement, violence, delinquency, teen pregnancy, etc.). Schools were identified by community members as an important—but missed—opportunity to increase youth engagement, raise achievement expectations and outcomes, and more comprehensively address students’ needs in ways that can prevent drug use and drug dealing. Participants wanted schools to go beyond health education and do more to bolster positive youth development and academic achievement. And what schools do should be allied to providing parents with the information and skills they need to be able to support school based drug education. This draft strategy of building skills, supporting positive health behaviours and the protective factors that make risky behaviour less likely allied to a wider prevention push on the social determinants of health is very attractive to me and fits neatly with the UN’s recent prevention standards. But it requires significant political will to make it happen, and that will be difficult to achieve in a period where resources are tighter than ever. In December 2007, Ethan, a 14-year-old boy, died as a result of a heroin overdose. Ethan was looked after and being supported by a range of services that were intended to protect him. Following his death, an independent management review was undertaken to establish what lessons could be learnt and what actions needed to be taken to minimise the risks to other young people. The Health and Social Care Information Centre have published their annual report on alcohol statistics as they relate to England. Professor David Nutt writes to the Times to make a point about the importance of survey design. As you can see he is pointing out that the way that the study that was reported recruited participants was likely to lead to over reporting of drug use. When the Home Office last reported on drug use by adults they were able to show prevalence levels by various occupations including those who were full-time students. What that data shows us is that while full-time students were the most likely to say that they have used drugs compared to other occupations it remains the case that 83.9% don’t report using drugs. This is important as Professor Nutt says because giving the impression that drug use is rife amongst student populations sets a social norm that may be self-fulling in that it sets expectations for future generations of university students. I’ve written before about how data is likely to drive decisions in what gets done in public health so it’s useful that there is now a Public Health Outcomes Framework website which provides quite a lot of information at a locality level. 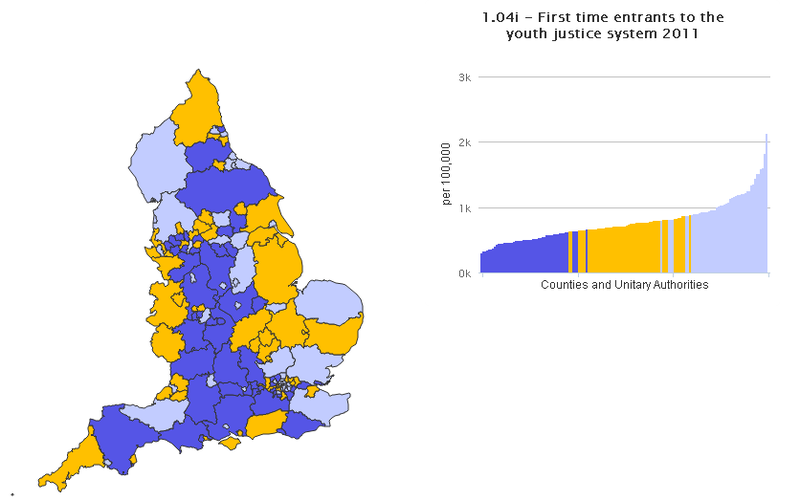 So below is a screen shot of a heat map depicting the number of first time entrants to the youth justice system per hundred thousand of population. There’s also regional level data – below are the proportions of pupil absence in the North West. 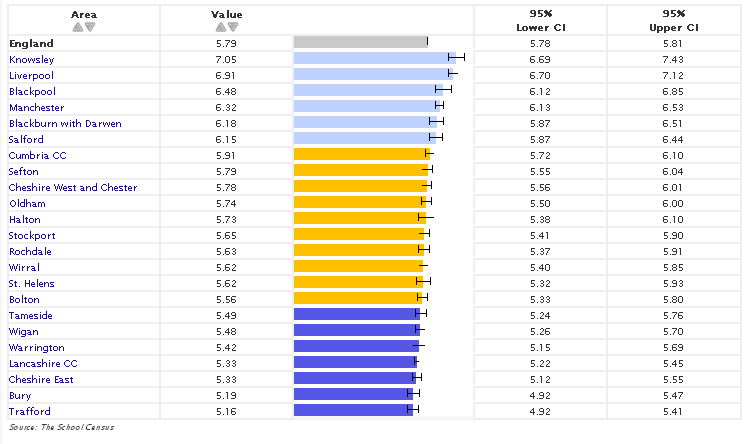 And the site lets you drill down to council level, below are some of the statistics for Birmingham that relate to the wider determinants of health as measured amongst young people. 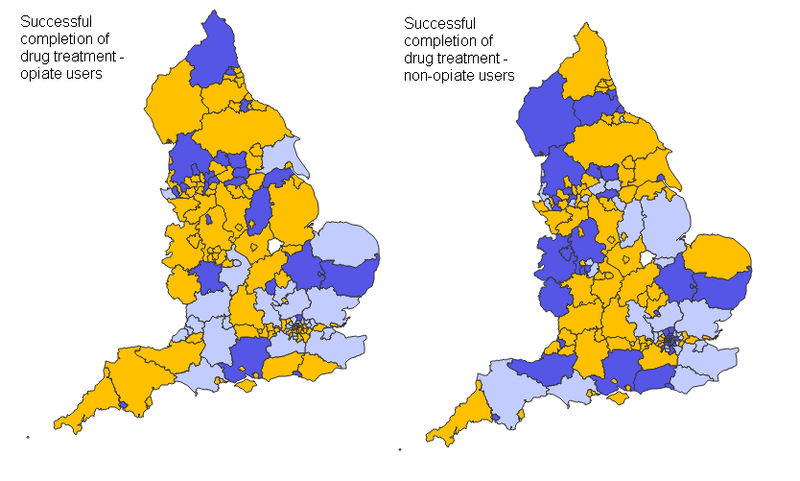 Users can see the outcome of drug treatment, the vast majority of whom will be adults (as you can see in the heat maps below this is broken down by opiate users and non-opiate users). As yet the alcohol related outcomes don’t appear to be available, nor are the prevalence data for smoking, drinking and drug use by young people, though if this tweet is anything to go by there are plans to keep adding to the data sets. @andrewbrown365 thank you! There’s lots more to come.